Water levels on the Mississippi River continue to fall near Vicksburg, Miss., seen in this Aug. 6, 2012 photo. ABOARD THE DREDGE JADWIN IN THE MISSISSIPPI RIVER – The drought of 2012 has humbled the mighty Mississippi River. A year after near-historic flooding, the river’s water levels are at near-historic lows from Cairo, Ill., where the Ohio River empties into it, to New Orleans, just north of its endpoint at the Gulf of Mexico. In July, water levels in Cairo, Memphis, Tenn., and Vicksburg, Miss., dipped below those of the historic drought of 1988. That’s affecting everything from commerce on the maritime superhighway to recreation to the drinking water in Louisiana. About $180 billion worth of goods move up and down the river on barges, 500 million tons of the basic ingredients for much of the U.S. economy, according to the American Waterways Operators, a trade group. It carries 60 percent of the nation’s grain, 22 percent of the oil and gas and 20 percent of the coal, according to American Waterways Operators. It would take 60 trailer trucks to carry the cargo in just one barge, 144 18-wheeler tankers to carry the oil and gas in one petroleum barge. MSNBC's Thomas Roberts talks to NBC News Correspondent John Yang and CNBC's Jackie Deangelis about the record-breaking drought gripping much of the country. That means each tow boat is moving less cargo than usual even though “it takes up the same amount of fuel to burn and the same amount of manpower,” said Ed Henleben, senior operations manager for Ingram Barge Co. in St. Louis. Already this summer, there are been 15 to 20 cases of barges running aground, according to Steve Jones, the Army Corps of Engineer’s Mississippi River navigation manager. Some cases have stalled river traffic for as much at three days. At this point in an average summer, there’d be only about eight or 10, Jones said. And as the water drops, the river channel narrows. 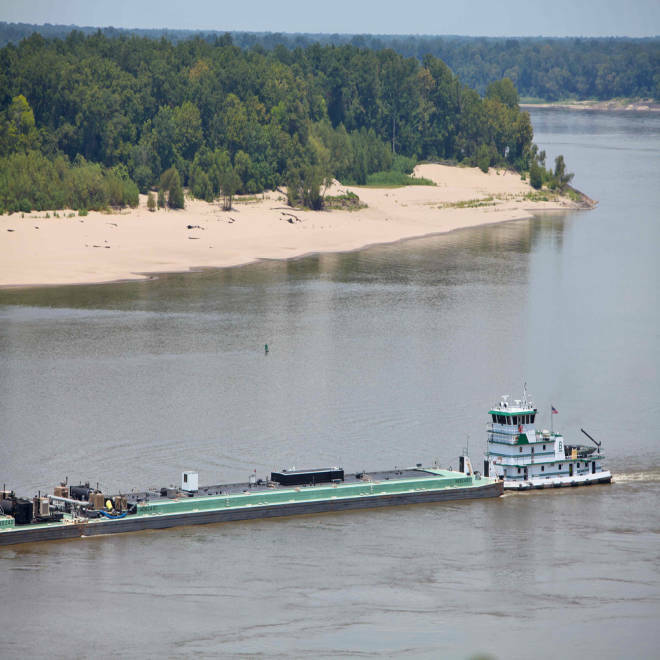 In some places, the Mississippi is a one-way river as barges heading north have to wait for traffic headed south, adding to the costly delays. The result: Millions of dollars in higher shipping costs. Economists say ultimately, it will be the consumer. “Some markets such as spot markets for agricultural products will be immediately impacted by increased transportation costs,” said Donald Sweeney of the University of Missouri-St. Louis. The Mississippi River, an essential waterway responsible for transporting billions of dollars of products every year, is becoming unnavigable. NBC's John Yang reports. The navigational hazards of the low water levels are compounded by last year’s flooding, which resulted in a great deal of soil and silt being washed into the river, altering and raising the riverbed. As the Army Corps of Engineers’ navigation manager, Jones spend eight to 10 hours a day directing dredges to keep a navigable channel from St. Louis south at least nine feet deep (a system of locks and dams manages the water depth north of St. Louis). So far, the government has spent about $60 million in the effort. The low water levels in the Mississippi are also resulting in a wedge of salt water creeping upriver from the Gulf of Mexico, threatening the drinking water supply in New Orleans. The Army Corps of Engineers hopes to begin work this week on a $5.8 million underwater barrier to block the saltwater’s advance. The river’s low levels are the result of a combination of the mild winter in the Upper Midwest, which resulted in very little snow melt to feed the river, and the dry spring and summer in the tributaries to the Mississippi and Ohio rivers. Drought conditions plague much of the United States after a summer of scorching temperatures and a lack of rain. 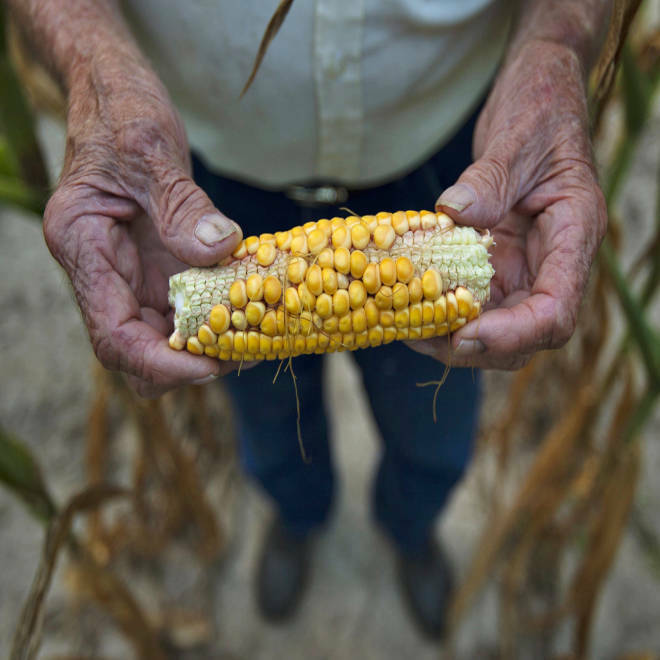 The dryness is affecting America's farmland, threatening crops like soybean and corn. Have you been affected by the worst drought in more than 50 years? Share your photos with us on Instagram, Tumblr or Twitter with the tag #Drought2012. You can also upload your photos in the box below.